We designed and sub-contracted the construction of our house ourselves. It was completed (or at least we moved in) early in 2002. The house is on a 750 millimetre compacted sand pad, to provide a base for the footings and enough height for the septic system. The footings and pad are concrete. The walls are double brick and the roof is Colourbond corrugated steel. The internal walls are rendered with plaster and the ceilings are generally gyprock except above the entry/living/mezzanine which have exposed beams with pine lining, and in the computers/office under the mezzanine which has exposed beams and painted chipboard. The design is aimed to be passive-solar, with larger north-facing windows and smaller ones to the west and south. A lot of thermal mass is provided by the bricks and concrete pad, and the ground under the house. The eaves are 700 milimetres which blocks most of the midday sun in summer but allows the sunlight through the windows in winter. A wood-burning fire heats the house in winter (we have established a grove of trees on the property to provide firewood) and since hot summer days are uncommon, no active cooling is required. The two courtyards will provide a sunny area in winter and a shady area in summer, with some protection from strong winds which occur in the region in all seasons. external view from the south west. Note the 12.5 metre pine glulam beam which supports the entire roof over the living/mezzanine, and in the internal view the scaffolding which is temporarily holding it up. April 2002: Our six month extension to our two year building license ran out on the 6th, and the inspector from Albany came on the 5th. We were dreading the inspection. We imagined that there could be all sorts of things which were considered wrong or unacceptable for some reason, which we would be required to fix, possibly in a hurry and maybe at considerable expense. The whole thing turned out to be less traumatic than we thought it might be. The inspector generally seemed to be quite impressed, and the only requirement was for a ballustrade on the stair - this did not surprise us as it was one of the things that we thought might not be acceptable. He was prepared to just trust us the add the ballustrade, so we are not under pressure to get it done in a short time - just as well as the ballustrade on the mezzanine took more than three months to get fabricated! Here are some more pictures of the house, taken after we moved in. The pond was constructed as the margin of the northern courtyard, with a wall just over 50 centimetres high, and built of double brick with a concrete-filled cavity; strong enough to hold the weight of the water. It is now complete with native fish and waterlillies, and frogs, water beetles and backswimmers have taken up residence. The southern courtyard was completed and the herb garden planted out. A friend contstructed a sculpture out of scrap metal retrieved from the bush around Denmark. We are considering building a wood-fired oven in one part of the herb garden. December 2003: The old house is completely demolished except for a few pieces of corrugated iron which have been left only to slow down the advance of the kikuyu. The yard has several stacks of salvaged timber and roofing iron, and the shearing shed is full of bits and pieces recovered from the demolition. Quite a few things were given away or bartered with various friends and aquaintances, and trailer-loads of rubbish went to the tip. It certainly has changed the look of the place. Some of the space where the old house was is now allocated to the new garage. We are doing the garage building ourselves so it is going very slowly, but at least there is a large selection of timber from the old house to use for the frame. It could easily be another twelve months before we can drive the car in. Hopefully the planned studio will be constructed a lot faster than the garage. The space for it between the garage and the water tank has been cleared and roughly levelled, and to encourage rapid construction we have decided on a steel-framed Colourbond-clad shed on stumps. The wall frames will be prefabricated in Albany and two friends will help put it together. We have the second-hand windows and sliding door, and are just waiting on the holiday season to be over so that all the participants will be available and the fabrication can be started. The pond has settled into a pattern which involves varying degrees of algal bloom, but this year for the first time (despite not following the frog-friendly design guidelines) frogs have bred in the pond - it has large numbers of impresssively fat tadpoles. We have no idea if the fish are still alive but everything has to look after itself in an outdoor pond like ours. At last the studio construction is well under way after the council took ages to approve the plans and then the fabrication firm took twice as long as they said they would to construct the frames. 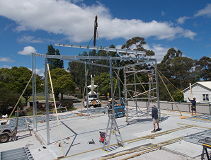 In contrast to the garage, the studio is all steel, chosen in the hope that it would allow faster and easier erection. It has, relatively, but is still taking months rather than weeks. When everything finally arrived on site we found that none of the underfloor steel was cut to size; luckily we had access to a metal-cutting saw. Then one panel was missing; after we had one built and delivered we found that it was the wrong size. We took it in on the trailor to be modifed and waited while they tacked another piece on; luckily we measured it before leaving the workshop because they still had it wrong. Finally it was correct but then back on site it turned out that another piece of steel had not been provided. Since that has been sorted out, things have gone OK with the help of steel specialist Mark and his MIG welder. We think that a few instructions might have been useful. 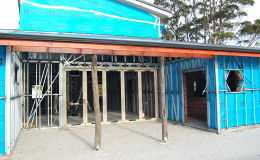 The garage is being built with timber framing from the old house, western red cedar cladding and a steel Colourbond roof. All the timber including the frame is being painted with a protective stain designed for western red cedar, which slows the process down but should reward us with improved resistance to weathering in the future. We are looking forward to collecting more water from the two new roofs once the buildings are complete; this year it looks like we will just get through to the winter wet season before our tank level drops too low. 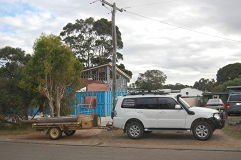 March 2005: The studio is now finished, at least on the outside, with a verandah on the front and a small deck at the back. 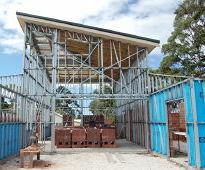 Both are constructed with timber and bricks salvaged from the old house which we demolished. With lights and power are laid on, the studio is now a very useful addition to the farm. Kaye has moved all the spinning and weaving gear in and Geoff has installed a bench and a large work table. As well, we have set it up for visitors, with a bed and bedside tables, a lounge and a few chairs. We have already had a few guests stay for a day or two, and by all accounts they found it very comfortable. Kaye has also used it for spinning, and is very happy with the extra space. However, there is still internal work to be done - the temperature inside the studio can get very high on a hot day, and will be rather chilly once the winter arrives, so it needs to be lined. We were hoping to find a cheap way of doing this (newspaper glued to chicken wire?) but may just settle for spending more money to get it completed faster, and go for some sort of thin particle board or plywood. Most amazing, after more than two years, the garage is also completed, and it seems to be a success (especially if you do not look too closely at the carpentry). The western red cedar looks satisfyingly 'natural' and a late design modification included some clear polycarbonate in the rear gable. This not only lets in more light, but saved a few western red cedar boards and quite a bit of angle cutting and messy fitting. The only problem is that the driveway which will lead to the garage has not yet been constructed, but in the mean time we can drive the car over the sand, so it is now happily living in its new home. July 2006: After lots of time-wasting, we eventually decided to line the studio with the corrugated iron from the roof of the old house. Firstly we framed the windows and doors with timber from the verandah of the old house, to provide an edge to work to around the openings. Then we started on the storeroom and used some old flooring to line the lower walls, installed shelving, and then did the upper walls in the iron. All the walls were then lined with iron over fibreglass insulation. After more discussion, we determined to do the ceiling with the corrugated iron as well. This was not easy to accomplish, as lifting sheets of iron above your head is a bit dangerous, but it all went without major injury. With several coats of off-white paint and the electrical fittings replaced the inside of the studio is now finished. We were impressed in the end by how much of the old house we were able to incorporate in the studio. We hung a set of colourful pictures which up to now had just been stored in a box, moved the furniture back in, and now the studio is ready to be overrun with junk, as are most spaces on the farm. We have started with a collection of computers and associated printers and other equipment, but are resolved to sort them out and bin all the stuff which is of no serious use. To complete the transformation, we arranged for some limestone rubble for the driveway. Now all we have to do is get some plants growing so that the place looks a bit less bare. Kaye wants roses. The pond is always a source of interest. After several years without seeing any sign of the fish (local native pygmy perch) we put in the pond soon after it was completed, we were amazed one day to see several dozen of them swimming around! Now there are about 30 - 40 of them including one huge one (about 70 mm.) and they get very excited over small pieces of bread or chopped-up yabbie thrown into the water. We also have flowering water lillies, papyrus and other plants, and lots of frogs - we counted more than 70 of them around and in the pond on one summer's day. On occasions we also get tiger snakes attracted by the frogs, but they do not seem to be a threat, especially once you know they are there. 2010: Without really trying to over the years we have collected a mass of old computers and related equipment. They were clogging up the studio and shearing shed and so we decided we needed a place to work on them - see if they were useful and if so find them a new loving home. Clearly another shed was required, so building on our studio experience we went for a steel-framed and Colourbond-clad structure with windows and doors which the local supplier had hanging around in his yard. 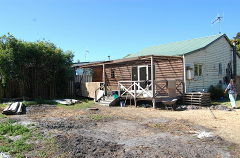 We used some timbers from our old house for "exposed" roof beams, the verandah post and the verandah decking and steps. It took just over a year to build (not bad for us) and eventually was lined with corrugated steel from the roof of our old house, was given its own mains power and even a water tank which had been hanging around the farm for years. April 2015: We are not getting any younger and realise that at some stage living on the farm, dependent on our car to get everywhere, will become increasing less viable. So we are slowly planning for a move in to Denmark, where we already own a block of land. There is a house on the block but it is an old wooden cottage which is not very big or in wonderful condition, so we are happy to demolish it and build (yet another) new house. We are working on a design which hopefully will give us all the space we need and re-create at least the general feeling of being surrounded by nature, but this is a bit difficult on a 1000 square metre piece of land surrounded by houses. We plan to have an internal courtyard (for when the weather is not conducive to being outside) and an outside courtyard with a pond and lots of plants, bounded by a wall of natural stone. 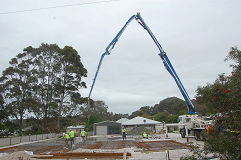 The house will have a concrete slab floor supporting a steel frame with brick on the inside (reverse brick veneer) and clad in Colorbond steel. 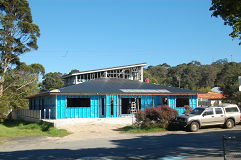 The roof will also be Colorbond. There should be room in the backyard for just one shed. January 2018: It has been a long time but we have actually started constructing our new house, with only a few changes to the plan shown above. In the time it has taken to get to this stage, we have not been idle, however. 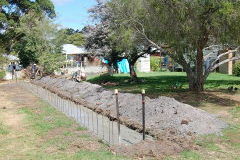 To provide a level surface for the house (and the yard) we constructed a retaining wall from Besser blocks at one side, to a maximum height of about one metre. This wall was continued along the back boundary and then continued further up the other side. All this involved huge amounts of concrete and reinforcing steel. 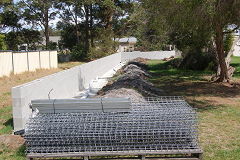 We installed steel panel fences on top of the block wall. While wall and fence building was proceeding, we demolished the old wooden cottage which was on the site. It was in even worse condition than we suspected, with an abandoned bee hive in one wall, very rotted timber stumps, and stringers in the roof with huge splits. The slightly dangerous job of removing the roof and the roofing timbers was completed without significant injury, and many of the materials were recycled - given to our friends - and some are already incorporated into other buildings. We saved the jarrah floor boards and some other stuff for ourselves, most of which will probably find a home in the new house. We were glad that we did the demolition ourselves, ignoring the advice from some friends: "why not just pay someone to do it?". Apart from the fact that we saved money and managed to recycle a lot of the materials, it turned out that there was loose fluffy asbestos in a cavity above the wood-burning fire in the lounge. When we discovered it we had it professionally removed, but a contractor using a machine to push the house over would not have realised it was there, and it would no doubt have blown over a large area of Denmark. Once the cottage plus at least six electrical earths, a variety of used and unused drainage pipes, buried granite pavers and a the stump of a large palm were removed, soil was excavated and new fill added and compacted ready for the concrete house footings and slab. Demolition had started with the old free-standing laundry plus the removal of rocks and pipes and rubbish. 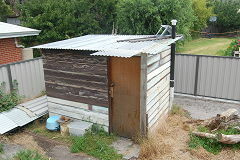 A building site needs a toilet, so some of the materials from the laundry plus timber and a door we had "hanging around" were used to construct a small rough shed. We purchased a small Clivus Maltrum composting toilet and installed it with a solar panel and battery to run the fan. It seems to work very well. 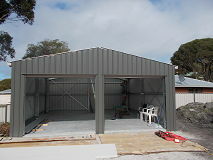 Since access to the rear of the block would be restricted once the actual house building got under way, and because having a lock-up shed would be useful during this process, we purchased a kit for a six by six metre shed and erected it against the back fence. The instructions that came with it were very poor and it was only due to the fact that we had a qualified engineer on the "build team" that it ended up properly erected. When we eventually move in this will be Geoff's workshop. In the mean time it has turned out to be very useful for storing tools and materials and providing a place to shelter from the sun and the rain. In October and November 2017 the concrete foundations and slab were poured. The limited access meant that a pump was required (with a huge "arm" to span the slab) but it also seemed to speed the process up considerably. Apart from a few weather-induced delays and last-minute hitches such as pipes moved or "reshaped" and some termite protection difficulties, it turned out well. The concreter also did the foundations for the boundary wall, so we had the wall constructed (in limestone-look brick) straight away - the neighbours on that side have been very patient and accommodating, so we did not want to leave them exposed to our construction activity any longer than necessary. The engineering requirements for the large room (we have changed its name from "inner courtyard" to "atrium") in the centre of the house were more heavy-duty than we assumed when we work working on the design. The fact that we specified a sloping diagonal ridge also led to a lot more complexity than we could ever have imagined. In the end it required 125 x 50 millimetre steel posts bolted with chemical anchors to the slab to support the steel H beams forming the perimeter of the roof. The ridge beam was too big for manual installation, so we had to hire a crane from Albany to get it in place. With only a few hiccups and the assistance of a lot of scaffolding, a scissor lift and Mark and his welding gear it all went together before Christmas. 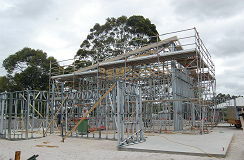 Serious scaffolding was required for safety reasons and for ease of working, hired from a specialist Albany company who deliver it and put it together. As a result it was expensive (more for the erection cost than the hire) so the entire atrium roof, including insulation and guttering, was built while the scaffolding was in place. 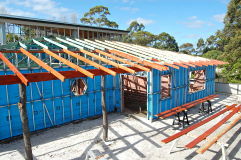 This also meant that we had to choose the colours of the cladding and roof rather earlier than we expected to. None of the colours on offer got us very excited, but in the end we selected a dark colour for the roof and a cream for the walls. When the main cladding is put on we might use a small area of accent colour or some stone "tiles" to break up the large area of plain colour and provide a bit of interest. Hopefully, when the building is completed and a garden established, maybe it will not matter much what the cladding looks like. Erecting the perimeter prefabricated steel wall panels turned out to be fast and relatively easy. 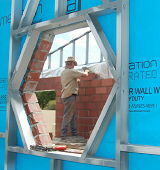 Several panels were put aside, to be erected after the bricks had been delivered to the site and placed on the slab. The steel frame was finally completed half way through February. The steel erection took all our concentration and lots of our time, so we welcomed a small hiatus in building activity before the bricklaying got underway. This allowed us to work on organising the bricks, steel and masonry lintels, brick ties, reflective insulation, dampcourse, door frames, internal window frames, an electrical sub-box, a cat door frame and all the other stuff which had to be available for the bricklaying. The bricklaying took almost four weeks and was finally completed by the end of February. It went fairly smoothly after we came to a common view of what type of bricks the brick coursing was referring to, and despite having to apply reflective insulation to the cavity of all the external walls as the work proceeded. All the walls will be covered in plaster so we used "Maxibrick" everywhere except for a single line of face bricks forming an arch between the living room and the atrium. The only other "problem" was working out what heights the walls should go to in the living room, which will have exposed beams. It had taken us a long time to get our heads around the required beam arrangement and the brickie had the same difficulty - we are not sure if we convinced him in the end that our approach would work out and in fact was the only reasonable way to go. 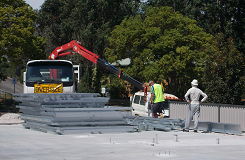 Our roofing team was not ready to start when the bricklaying was completed but they eventually got going. As the work continued we seemed to be ordering huge amounts of timber, but in the end most of it, except for a big pile of waste offcuts, ended up somewhere in the building. All the timber which would be on show was painted before it was used; this involved extra effort at this stage but it would have been even more difficult once it was in place. After initially thinking that the plasterboard for the exposed beam ceiling would have to go up after the beams but before the battens (and before any rain!) we found out that we could leave this step until after the roof was on - a lot easier and safer. After a few false starts and with help from our neighbours, we sourced the verandah posts from a farmer 150 kilometres away in Gnowangerup, who cut them the day before we went to collect them. They are jam trees, an acacia, and a variety often used for fence posts due to their natural resistance to termites and rotting. The timber is very hard and heavy, and installing the posts involved quite a bit of muscle. Apparently the bark will come off in a year or two but the timber underneath will still look good. Most of the roofing was prefabricated trusses, but they still took quite a bit of "working out" and effort to get them in place, especially since the truss designers failed to appreciate that some of the walls shown on the plans did not extend all the way to ceiling height. A lot of the remaining timber other than the battens was 290mm x 45mm treated pine, ordered and often used in six metre lengths. The timber work was completed by the start of May including (after a lot of discussion and changes of detail) the carport. The gutters, insulation and roofing Colorbond went on in three weeks during a very unseasonal period of dry and windless weather. The cold and rain had to come eventually (and our builders had to go to another job) which put a brake on building progress. The appearance of the house did not change much but there was some progress - the plumber and the electrician worked on installing pipes and wires and the initial data/phone/TV and solar panel cables were put in place. The LH picture shows an en-suite electical conduit chased in to the wall; the reason it is curved is so that it misses the masonry lintel over the doorway. One other milestone was the installation of the bifold door frames, with the glass and insect screens to be put in later.